How to stay healthy even if you are a rice/roti lover? Please note - I’m talking about “staying healthy”. If you are looking for weight loss or managing lifestyle ailments like diabetes, these pointers are still relevant but might have to be customized depending on your health condition. A few days back, I wasn’t feeling very hungry around lunchtime and was also feeling too lazy to cook for myself. I made a salad (bell peppers, cucumbers, carrots) with a lemon-extra virgin olive oil dressing and also boiled one medium-sized sweet potato. 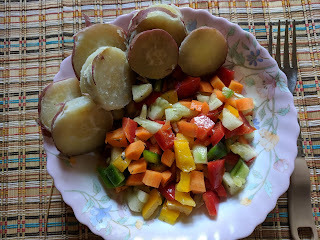 After eating a small bowl of salad and the boiled sweet potato, I felt hungry in an hour’s time. I have seen many pics of such salads being shared on Instagram. Frankly, this salad-as-a-meal thing doesn’t work for me. I’m sure many of you who love Indian cuisine would feel the same. Many health advocates and nutrition experts would suggest “control your carb intake. Stop eating rice and roti. If you have to, eat 3 tbsp of rice OR 1 chapathi”. And some of them would even go onto advocating pasta, oats and quinoa as alternatives. I have earlier written about how pasta is so high in carbs and why we(Indians) don’t need quinoa. Do check them out if you haven’t. And there is also the Keto / LCHF trend, where people eat carbs carefully measured in gms. Sorry, this whole idea doesn’t appeal to me. I love my rice and roti and I’m not going to give them up in order to stay healthy. 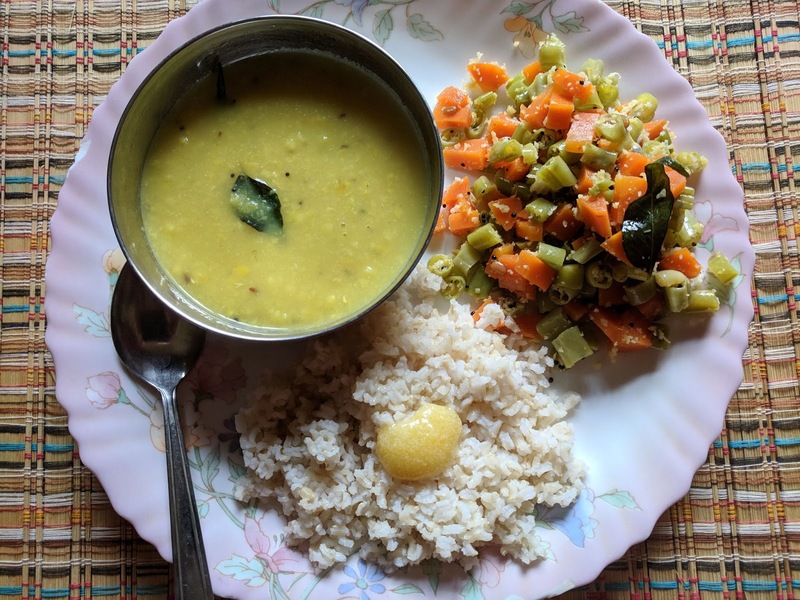 Having said that, let me share 10 tips that have helped me to stay healthy and maintain my weight "in spite of eating rice and roti”. (2) I prefer to eat 3 proper, wholesome meals. This prevents me from mindless snacking. I had written about this habit in detail in this post. (3) Even though I eat rice and roti, I don’t overeat. If it is rice, I eat around 60 gms (uncooked rice measurement). As for rotis, it would be 3 small phulkas. Yes, there were a few times when I have eaten more rice than usual and ended up feeling sleepy after lunch. It’s all about figuring out the quantity that gives you the satisfied feeling, but at the same time, doesn’t trigger a post-prandial nap. (5) A complete full stop to all packaged foods. I don’t like to eat chocolates or ice-creams either. (8) I finish my dinner atleast 2 hours before bedtime. Dinner menu is usually the easily digestible rasam rice or idli or dosa. Definitely not a bowl of high-fibre salad that needs more time to digest. (9) Eliminated refined cooking oils from my kitchen. I use cold-pressed groundnut, sesame and coconut oils and in less quantity. (10) Last but not the least, regular practice of Yoga - I go for Yoga classes atleast 3-4 days a week. I also try to stay active throughout the day. Even on days when I’m not stepping out, I tend to move around in my home. Bonus tip - I eat ONLY when I feel hungry. Hunger is a signal to indicate that our digestive juices are ready for the next meal. So when we eat after we get the "signal", food gets digested easily, irrespective of whether we eat rice, roti or salad. These tips have also helped me manage my PCOD condition to a large extent. Even if I sound like a "thenja pazhaya cassette" (old overused cassette), let me repeat it once again - Packaged foods are the culprit. If you completely eliminate them, most of your health issues would automatically get sorted. You don't have to suffer by eating 1 roti or 2 tbsp rice! Follow me on Instagram where I share my meal plates that are homely, wholesome and mostly Indian (with rice or roti).